Nazarene professor, author, and theologian Thomas Jay Oord has written a wonderful blog post on what it means to be Wesleyan. Oord points out that John Wesley is considered the primary theological ancestor of over eighty Christian denominations. Oord has written a list of 12 concepts that he believes paint a general picture of what most Wesleyans of today would affirm. 2. God is triune. The Father has been revealed in Jesus Christ through the power of the Holy Spirit. 4. Jesus’ life, death, and resurrection make possible a fruitful relationship with God and hope for transformation in this life and the next. 5. God does not predestine some to heaven and others to hell. All have the opportunity to experience eternal life both now and in the future. 6. Christians should consult the Bible, Christian tradition, reason, and contemporary experience (i.e., the Wesleyan quadrilateral) when deciding how to think and act as Christians. 7. The Bible’s primary purpose is to teach the way of salvation. One may or may not affirm its statements about scientific, historical, or cultural matters. 8. The Church and its practices are crucial to Christian understanding, right living, and compassion toward others and oneself. 9. God values and seeks to redeem all creation: humans and nonhumans. God cares about the whole and not just a few. 10. Transformation from a life of sin to a life of love begins in this life. Christians are not merely waiting for the afterlife. They can experience and promote abundant life now. 11. Personal and corporate religious experience, not merely rational consent to Christian doctrines, characterizes the flourishing Christian. Both heart and head matter. 12. Christians are sanctified as they respond appropriately to God’s empowering love. Sanctified Christians love God, others, and all creation, including themselves. Some responses to live in holiness represent important turning points in the Christian life. You can read the rest of his post here. What do you think of the concepts he lists? Thomas Jay Oord, one of my favorite theologians in the Church of the Nazarene, posts here with a preview of the keynote address from the upcoming The Bible Tells Me So conference. The address is being given by Randy Maddox, considered by many to be the world’s foremost authority on the theology of John Wesley and how Wesley viewed Scripture. Of particular interest to me was Oord’s summary of Maddox on a Wesleyan view of inspiration and interpretation of the Bible. Maddox says Wesley’s deepest concern was personal embrace of the saving truth in Scripture. Even “the devils” believe the Bible, says Wesley, but they do not embrace its saving truth for themselves. Wesley believes we need to read the Bible “in conference” with others. Some people are simply more mature, and we can benefit from their insights if we listen in community. Meeting in groups to study the Bible is important for forming people and helping to identify the Bible’s central purposes. Part of interpreting the Bible well, says Maddox, involves “not limiting our dialogue partners to those who are most like us, or those with whom we already agree.” Those who see things differently than we do might identify places where our understanding of something in Scripture might be wrong. The connected issues of inspiration and interpretation seem of particular importance at current time, when the Church of the Nazarene is assailed by those who insist on biblical inerrancy – which the Church of the Nazarene has never held as a doctrine. 1. What does it mean to say the Bible is inspired? 2. On what questions is the Bible a trustworthy guide? 3. Is the Bible without error? 4. How should we interpret the Bible? 5. Does postmodernism influence the Bible? I found Oord’s discussion of these questions — as well as some of the comments on his post — challenging and thought-provoking. 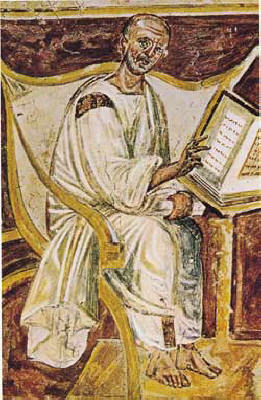 After admitting God only uses us, Augustine realizes he has another problem. His notion of use implies God desires something other than those whom God uses. But this cannot be, according to Augustine’s system of belief. God is the only valuable one. Augustine eventually confesses that actually God “does not make use of us, either.” God does not use us, that is, “in the same way as we use things.” “Our making use of things is directed to the end of enjoying God’s goodness,” he says. But “God’s making use of us is directed to his goodness.” In sum, God only loves himself. According to Augustine, therefore, God cannot love us in the sense of enjoying us. To do so would mean we have some value God does not yet possess. God cannot love us in the sense of using us. To do so would also mean God lacks something that God does not already possess. God cannot love us in either sense of enjoy or use—the only two ways Augustine thinks anyone can love.